Quintel has over 25 years of experience in heat exchanger fabrication and supply, and in the reconditioning and repair of heat exchangers. From merely plugging a tube, to complete heat exchange retubing and all the way to rebuilding your heat exchanger from the ground up, we have the knowledge and expertise to do it right and to guarantee it. Our ASME-code shop carries an R stamp, certifying our shop in the repair of boilers as well as unfired vessels. Our expert reconditioning and repair work on heat exchangers allows our customers to enjoy the same warranties as would apply to equipment direct from an OEM, but at a fraction of the cost. 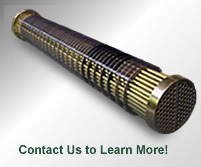 Every part of your heat exchanger can generally be repaired or replaced as needed. This includes shell replacement, channels, channel covers, tubes, tubesheets, baffles, tie-rods and spacers, seal strips, and other parts. We pride ourselves on our assurance that the reconditioning and repair of your heat exchanger is always the most cost-effective choice, for the simple reason that we will be the first to tell you if it turns out that it isn't the most cost-effective choice. Every heat exchange unit that leaves our shop is guaranteed against leaks. A thorough set of non-destructive tests is performed as appropriate to the vessel, including air testing of the tubes and the complete assembly, a vacuum test, and a hydro test. 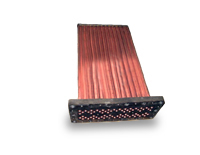 Quintel can perform either complete or partial heat exchanger retubes, and can, as necessary, manufacture a new bundle assembly, shell, or end channels. 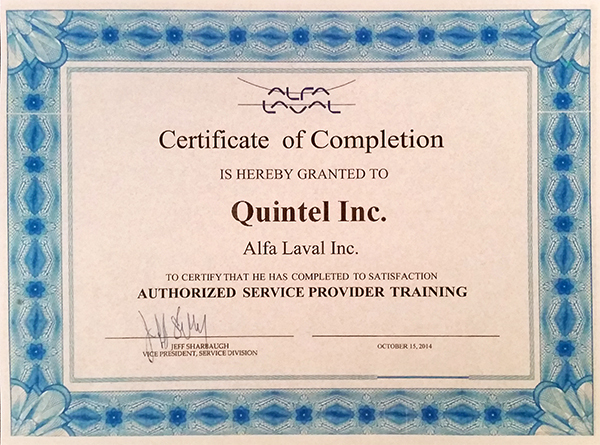 Quintel is also a reseller of heat exchangers and heat exchange equipment for several of the major OEMs. Everything is thoroughly tested before being shipped out, saving our customers from risks of downtime.